I am pleased to be joining Cathy at Rambling in the Garden, along with her many fellow meme fanatics, in producing a vase of materials from my garden this Monday. There wasn’t much to choose from! But one Iris reticulata flowered a couple of days ago and I immediately had my eye on it for my vase. Since only one has appeared so far this year I needed some filling material, so I cut some of the deep red Euphorbia that will need cutting back in spring anyway, a few remaining strands of grasses, and two large, deep red hellebores. The dark hellebores are one of the first plants I bought for this garden, and I do look forward to them every spring. This is also the healthiest of them all, with no black leaves. I can almost believe the sun is shining when I look at these pictures, but unfortunately it isn’t! Another wet and grey day, but we have had some sunny weather in between, and surely some more spring sunshine will come our way again soon. Hope you have some sunshine this week! This entry was posted in Garden, In a Vase on Monday and tagged Cut Flowers, Garden, Spring, Winter. Bookmark the permalink. ← In a Vase on Monday: Bling! I have a few more coming into flower now, but our temperatures have been quite a bit lower than yours! Enjoy that warmth Arthur! Iris reticularta is always gorgeous, I love them even though they don’t last long in the garden, most of mine have finished now and are just long leaves. But the star of your vase is that fabulous dark Hellebore and how nice that you have that special memory of it being the first plant you bought for the garden. I hope your weather improves; it’s been raining here for three days but the worst thing has been the wind. Hi Christina. It snowed here Monday night and my hellebore looked quite sad, but by Wednesday evening it had all melted again. Still very cold and damp and spring is edging nearer so tantalisingly slowly! Gorgeous! A real pick-me-up…it’s snowing and icy here today! I know your winter can last a lot longer than ours Sheryl, so glad to share the little bit of colour I have. Spring is coming, but oh so slowly! This is a fabulous vase – I love the hellebores and the zingy iris. Thanks Sam! Looks like some more of those iris will be flowering soon. I must plant some more! Cathy I love the dark hellebores and stunning with the iris and seedheads! Hoping still for an early spring here…but about another week or 10 days fo winter weather still here to work through! Your vase displays are always “outside of the box.” You inspire me. Thanks. So unexpected, this blue with yellow in your vase. We had blue skies, yellow sunshine and frost at night during the last 3 days. Yes, exactly… the blue and the yellow of the iris close up are so lovely. We had a little snow earlier in the week, but back to grey and damp again today! Have a lovely weekend Uta! Love the iris and the whole composition. Beautiful combination! 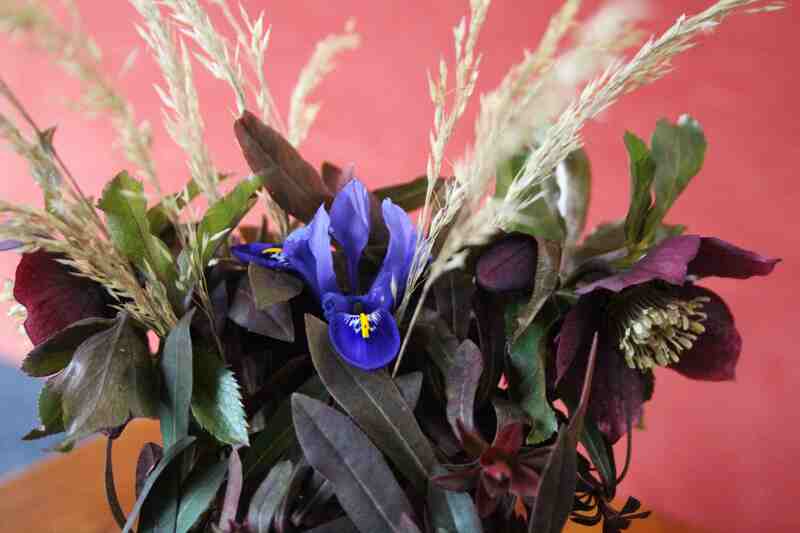 I have also used Irises for my vase today and I spent some time deciding what to use as fillers. I had to give the fillers some thought, as there isn’t much out there yet. But spring is slowly edging nearer! The gorgeous iris has my undivided attention! My mother loved them. Growing up in the country she planted them all over the yard. She was especially fond of the blue and purple ones. Thank you for your encouragement Cathy. I hope to have more bits left over from pruning soon, but must be patient for just a little bit longer as it is still far too cold and damp to do anything outside! Nice rich colors. The iris is lovely. The hellebore color is magnificent–wonderful to see it return each year I imagine. What a great use of flowers and colours this week Cathy! I would never have thought to put the little iris in a combination like that – it really sets it off. The weather is still quite cold and variable here although we did have a couple of hours of lovely sunshine this morning. Thank you Julie. 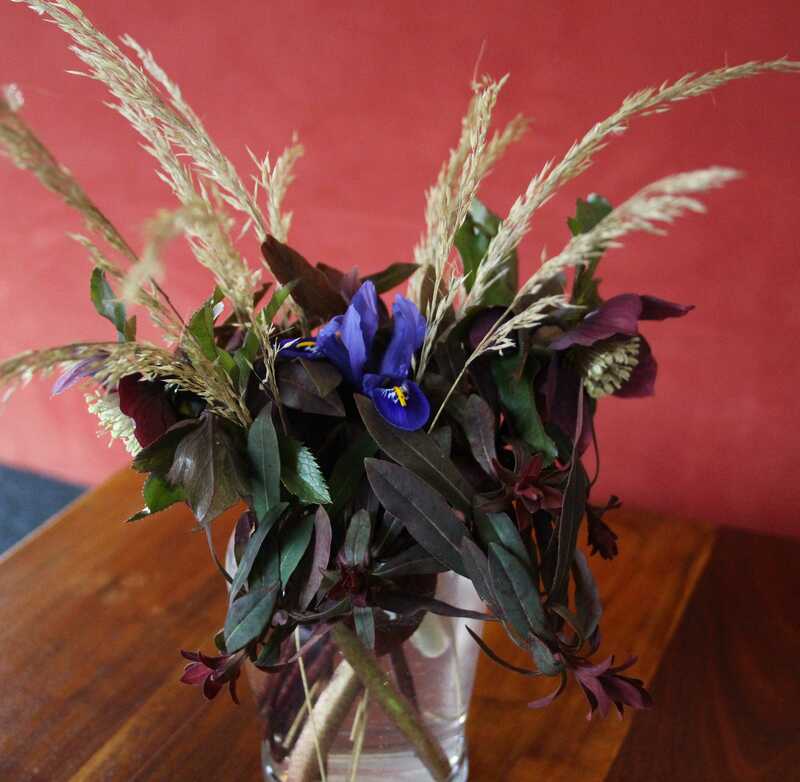 This combination is a perfect replica of the colours in my garden right now – mostly brownish red and dark green, with the odd splash of colour. We have had more sunny days than usual this winter, but the sky is still mostly grey… can’t wait for some more sunshine! 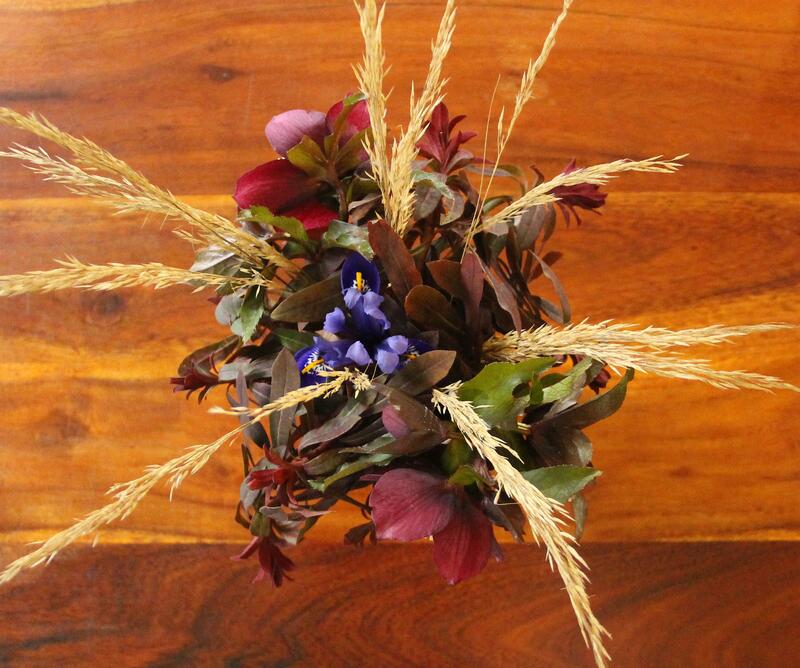 Lovely bouquet…I’m rooting for you to get more springlike weather. Lovely rich colours and the grass complements it so well. It is so cold here, how we all long for some real spring weather. Not long now. Yes, spring can’t be far off now. Hope you get some warmer weather soon too Chloris! Love the color of the dark hellebores…combined with the iris and the colors remind me of royalty. Oh yes, I can see that too Karen. 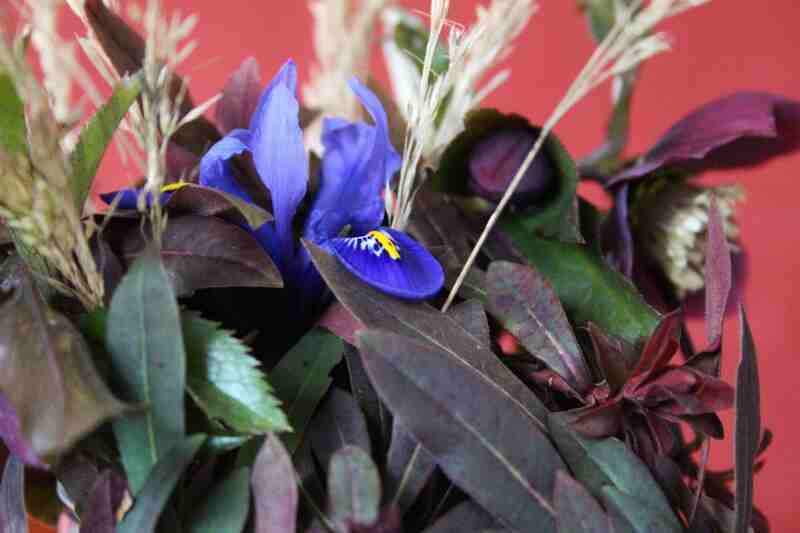 Purples, deep reds and blues are often regal colours. I am enjoying the blue most of all right now. Amazing how you find something every week even in this weather. Lots of sunshine for you, too! Oh yes, the happy dances come at regular intervals once spring gets going… each time a new flower appears! LOL! 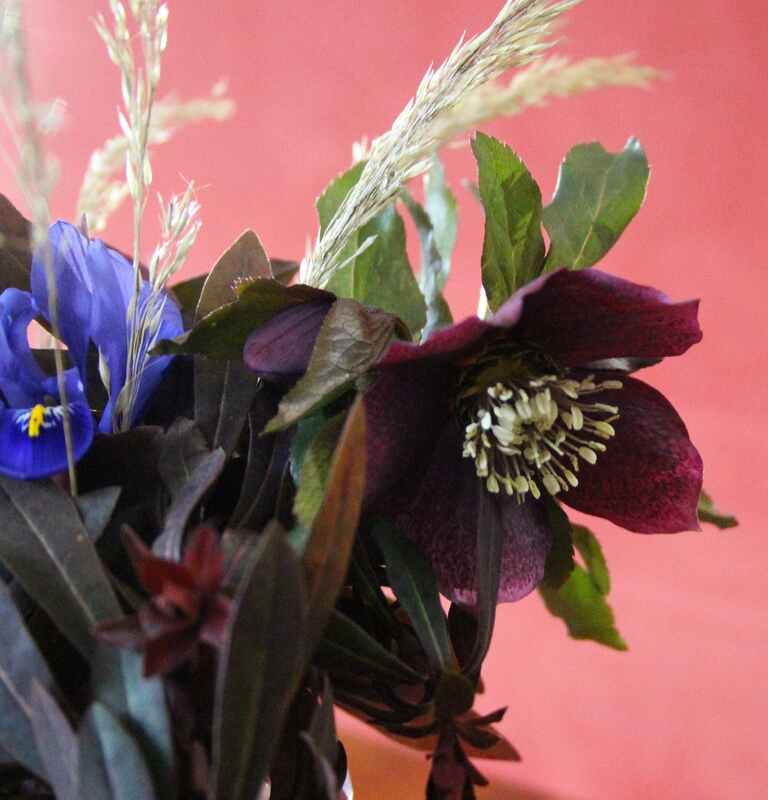 Sometimes a dark arrangement makes the lighter elements stand out, like the stamens on your deliciously dark hellebore, which the lighter grasses pick up. I like this one! Thank you Noelle. I think we look at the contrasts and details much closer at this time of year and also by cutting flowers to bring them indoors; I could see the stamens on the hellebore and the yellow pattern on the iris so much better through the lens of my camera! Oh that euphorbia and hellebore must have been meant for each other Cathy. I hope that you are not waiting long for that spring sunshine. It’s disappeared from here and winter really returned with a vengeance today. The iris looks great with the tan grass and dark hellebore. I love that dark hellebore Cathy, it goes beautifully with the grass heads. I have a single iris reticulata flowering in my back garden, looks very like yours. Hope we both have large bunches to pick next year!!! Thanks Bec, I love all my hellebores, but this one is special. 😉 Have a great week too! The weather has been so unwelcoming for going out in the garden that I have no qualms at all about cutting everything to bring indoors at the moment! 😉 A couple more irises are open now, but we had an icy shower of snow and rain this morning so I hope they haven’t suffered!